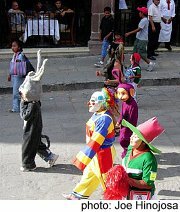 O n the calendar for June, events in San Miguel de Allende are religious or crazy...or both. The craziest day of the year, Día de los Locos (literally Day of the Crazies), brings crowds and madness to the old cobblestones streets. As the summer solstice approaches, June days are longer—more time to bask and play—and the heat is generally tempered by the first of the summer rains. Brief afternoon downpours turn the hilly streets into raging rivers that soon drain off and dry out when the sun returns. Then the air is like glass and the sky a deep blue crystal ball overhead. Most of the summer visitors are still packing their bags back north and the long days can be a lazy as you want them to be. This more laid-back time of year still has it share of meetings, lectures, readings, art shows and everything else that goes with being in a vibrant arts community. 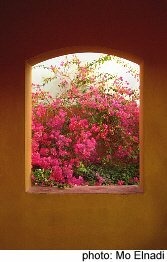 June events in San Miguel de Allende can keep you busy without frenzy. Early June - Festival of Corpus Christi. This is a movable holiday (sometimes in late May) and always falls on a Thursday. The morning is for the kids. It's a day when they get presents—toy shops are on high alert at this time—and perform folkloric dances in front of the Parroquia. In the afternoon, a more somber tone takes over. Windows are draped with red and white banners, and the procession of the Blessed Sacrament wends its way through the streets, stopping at several points along the way for prayers. June 13 - Feast of Saint Anthony of Padua. The second most important saint in San Miguel receives his due today. Nightly fireworks for a week or more lead up to the day. Mid-June - Día de los Locos. This wild and woolly festival is pure San Miguel. It happens no place else in Mexico in this form. It always takes place on the Sunday closest to June 13 since it is related to St. Anthony. Though the flamboyant procession rocks through town to the (very loud) beat of amped-up music, and the costumes and masks of politicians, actors, cartoon characters and monsters would seem to be totally secular, this complex festival has deep religious roots. San Antonio is, among other things, the saint you beseech to find anything lost, from a wristwatch to a dog to a lover. Today's festivities are all about giving thanks for having found them. As they shimmy, shake and stamp their feet aboard their truckbed floats and throw fistfuls of candy at the crowds like Mardi Gras revelers, the participants are actually taking part in a rather profound religious celebration. June 21 - Summer Solstice, the longest day of the year. There are usually observances of the phenomenon at El Charco, the botanical garden and preserve at the southeast edge of town. Third Sunday in June - Fathers' Day. Children honor their fathers on this day, but it is nowhere near as important as Mothers' Day. June 25 - Anniversay of the death of Ignacio Allende, killed by a firing squad in Chihuahua in 1811 for his participation in the drive for Independence from Spain. His severed head was displayed in a metal cage at one corner of the Alhóndiga (granary) in Guanajuato and left there for 10 years. There are also lots of one-off June events in San Miguel de Allende—lectures, films, gallery opening and the like. Check Atención, the weekly newspaper, for specific details.